Ni dhéanfaidh polasaí iontrála Ghaelscoil Osraí aon deighilt idir phaistí ar bhonn chúlra soisialta, cinne nó inscne. Tá comhcheart iontrála faoin bpolasaí, cé go bhfuil liosta chritéir a rialaíonn an tórd dáileacháin áiteanna. Tá sé mar pholasaí na scoile go gcuirfí réimse ábhair foghlama churaclaim idir téacsleabhair, áiseanna breise, bogearraí agus treallamh spoirt go bhfuil cothrom-inscneach. Úsádfear gach aon deis chun cothromaíocht inscne a chur chun cinn sa churaclam discréideach agus folaithe. Déanfaidh múinteoirí agus foireann na scoile gach iarracht chun an churaclam a chur i láthair i slí chothrom-inscneach agus go n-úsáidfí gach deis chun feasacht na bpaistí ar meoin neamhaireachtálach a árdú. Ní bheidh aon deighilt inscne i gceist le dáileadh ranganna sa scoil. Mar atá aontaithe lenár gCoiste na dTuismitheoirí, caitheann gach páiste éide oifigiúil na scoile. Mar chuid de sin, ta rogha idir sciorta nó bríste a chaitheamh ag cailíní na scoile. Ní bheidh aon ní luaite in aon fógra na scoile a thaispeánfadh tosaíocht rogha inscne riamh. Ní cheadófar aon cheist in aon agallamh a bhaineann leis an scoil go bhféadfaí aon idirdhealú inscne a bheith ceangailte leis. Bord Bainistíochta: Tacú leis an bpolasaí seo agus éiteas chothromaíochta agus comhionnan páirtíochta na scoile a chur chun cinn. Foireann na Scoile: Chun comhionannas agus cearta gach éinne a chur chun cinn, laistigh do chláir ar leith oideachasúla na scoile agus sa churaclam folaithe tríd an lá scoile ar fad. Tuismitheoirí na Scoile: Chun cothromaíocht a chur chun cinn sa scoil agus chun tacú le polasaithe na scoile sa mhéid seo. 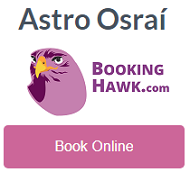 Cuireann An tAcht um Stádas Comhionann 2000 bac ar idirdhealú inscne i dtaobh sholáthair seirbhísí. I nGaelscoil Osraí tá sé mar pholasaí againn deiseanna chothroma a chur ar fáil do bhuachaillí agus cailíní i réimse iomlán an churaclaim agus in imeachtaí spoirt ach go háirithe. 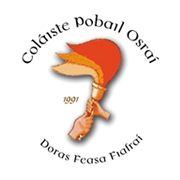 Is fostóir Deiseanna Chothroma í Ghaelscoil Osraí. Glacaimid le coinníollacha an tAcht Chomhionannas Fostaíochta 1997 i dtaobh foireann a fhostú. Ní chuirfear aon ni riamh in aon fógra fostaíochta na scoile go bhféadfaí tosaíocht inscne a léamh as. Ní chuirfear aon cheist riamh in agallamh na scoile go bhféadfaí idirdhealú inscne a bheith léirmhínithe ann . This policy is devised to comply with various acts of the Oireachtas such as Education Act (1998) the Equal Status Act (2000) and the Employment Equality Act (1998) and it seeks to promote the principles of justice and equality for all members of the school community. • The enrolment criteria of Gaelscoil Osraí will not differentiate between pupils from different social strata. There is an equal right of access under the school’s Enrolment Policy. textbooks, ancillary materials, software, sports equipment etc. • Every opportunity will be taken to promote gender equality through the discreet and hidden curriculum. • Teachers shall ensure that the language used in the school to mediate the curriculum is gender balanced and shall avail of opportunities to raise pupils’ awareness of unconsciously held attitudes. • There shall be no differentiation between the sexes in the allocation of classes. • As agreed with the B.O.M. and parents all pupils in Gaelscoil Osraí shall wear a uniform. • Nothing may appear in an advertisement which would indicate a preference for one gender over another. • Neither may any question be asked at interview which could be interpreted as discrimination on gender grounds. • This school is an Equal Opportunities Employer. The B.O.M. : to support the policy and to maintain the ethos of equality and participation for all members of the school community. The Staff: to promote the concept of equality and justice for all, both within specific educational programmes and in the “hidden” curriculum throughout the school day. The Equal Status Act 2000 precludes discrimination on the gender ground in the provisions of equal services. At Gaelscoil Osraí it is our policy to give both boys and girls equal opportunities in curricular and sporting areas. This school is an Equal Opportunities Employer. The Equality Employment Act ’97 precludes discrimination on the gender ground in the employment of staff. Nothing will appear in an advertisement which will indicate a preference for one gender over the other. Neither will any questions be asked at interview which could be interpreted as discriminating on the gender grounds.